Forced air furnaces require a filter to function properly and prevent pollutants from entering your home. This furnace filter needs to be checked every few months and changed when it is dirty; more frequently during the winter months when your furnace sees heavier usage. Here we provide a simple step-by-step guide to changing your furnace filter. The first thing you should do before performing any sort of furnace maintenance is to turn off and unplug your furnace. Then you need to determine what type of filter you have. Your existing filter will be located inside the furnace or the air return vent and will have arrows on it showing airflow direction, which you will want to remember. It may help to write this down. The filter size will also be printed on the cardboard filter frame. If your filter has a plastic frame instead of cardboard, it’s reusable! You just need to clean it periodically with water and a vacuum, rather than replacing it. If you do need a replaceable filter, the next step is to get the right replacement. You’ll want to make sure to get the same size filter so it will fit your furnace correctly and allow it to function efficiently. Most hardware stores and home centers, as well as many online stores, sell replacement disposable filters. Your HVAC professional can recommend a correctly-sized filter that is effective at removing contaminants from your home’s air. For even more efficient removal of harmful air-borne particles, consider an air scrubber such as the Trane CleanEffects Air Cleaner, which removes up to 99.98% of pollutants and allergens from the air. Once you’ve located the correct replacement filter, all that’s left to do is install it. There will be markings on the filter that tell you which side should face the furnace. 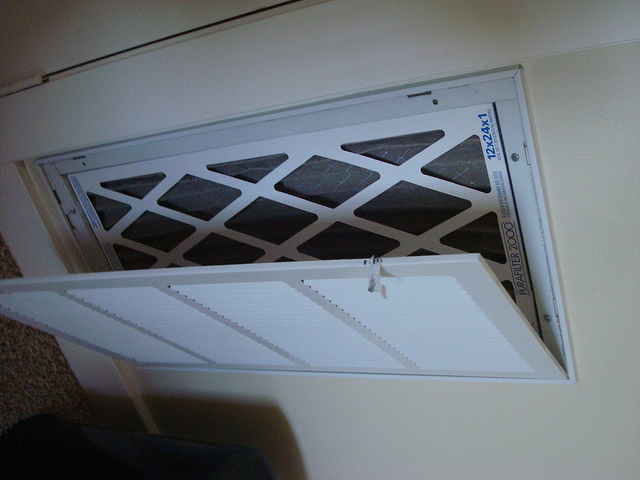 Slide your new furnace filter into place, keeping in mind the proper air flow direction, and replace any covers. You’re all set until it’s time to check it and change it again!